Greece 1973. In November 1973 we began our love affair with Greece. We flew to Athens for a week with a group, and were free to do what we wanted but went on optional tours which were offered during the period. Our hotel was opposite the Athens Polytechnic, little did we know what a dramatic role the hotel was to play at the end of our holiday. These were the years of rule by the ‘Colonels’ which unbeknown to us was just beginning to come to an end. During our first morning we went to the Acropolis. (above) the approach to the Acropolis. The Parthenon. Where is everyone? In those days as you can see from our photos, there were no crowds, no queues, a small amount of scaffolding, no fences, the Parthenon was completely open to the public to roam among its columns at will. We did not realise how lucky we were. In subsequent visits, the queues and crowds were appalling and the Parthenon was covered in scaffolding and I understand that no one can now enter the temple. One evening we returned to sit on the steps of the Parthenon and watch the sun set. The stones all turned a golden colour for a few minutes, Magical. We saw the Erechtheon with its porch of the Caryatids. I understand the Caryatide have now been dismantled and re-erected in the museum and a copies put up in its place. Thank god we went there when we did. The Erechtheon, on the Acropolis. Now called the Old Temple of Athena (529BC). The Turks turned it into a harem for the wives of the Commandant of the Acropolis and damaged what had remained of the the interior and of course Lord Elgin helped himself to one of the columns including its base and capital (now in the British Museum) and also one of the caryatids (also in the British Museum) which has been replaced on site by a cast. The sculptors of the caryatids apparently used as model the girls of Kakryai, in Lanconia, whence the name caryatids. We then came down and visited the Odeion of Herodias Atticus built to commemorate Regilla wife of Herodes who died in AD160. It has an audience capacity of 6000. Also the Theatre of Dionysos, both at the foot of the Acropolis. 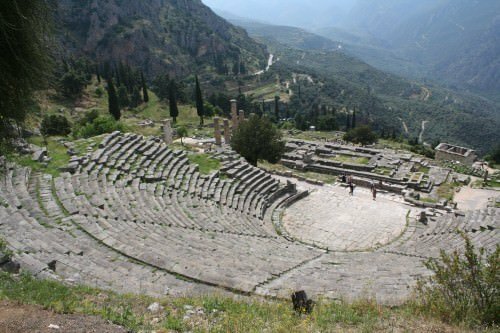 The Theatre of Dionysos was built in 342-326 BC and was modified by the Romans. Originally the front row had 67 individually named marble thrones each bearing the name of the priest or dignitary for whom it was reserved. (60 remain). The theatre seated 17,000. We next visited the National Archaeological Museum, it was exciting standing in front of sculptures we had so often seen in books. The Poseidon. Discovered in a ship wreck in the 1920s. 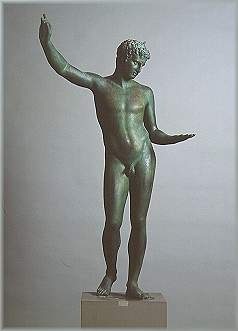 The Ephebe of Marathon, a Greek bronze found in the Aegean Sea in the bay of Marathon in 1925, dated ca 325-300 BC. A revelation when seen in the round. And of course we saw the Schliemann finds at Mycenae. Cases of gold objects, I remember two beautiful daggers covered in figures and of course those haunting gold masks from Mycenae. Over the days, when we returned from other trips, we visited the Monument of Philopappos a monumental tomb 114-116 AD with magnificent views over the city. The visited the Kerameikos and some of the many tombs. One was being plaster-cast presumably with a view to removal to the museum like most of the others by now. We walked around the Theseion, really the Temple of Hephaistos and Athena which is one of the most complete Doric temples and came on us as a surprise as we could not recollect seeing it in any of our books on Athens. We walked through the ruins of the Agora, and found it difficult to sort out the buildings, such as they were. The Stoa of Attallos, now the Agora Museum, was shining and new with its colonnade of 45 columns and came as a bit of a shock. It now houses the considerable finds from the Agora. Finally we tracked down the graceful Tower of the Winds (1st century AD) which in its day served as a sun-dial, water-clock and weather-vane. The Arch of Hadrian was a disappointment. However the Olympieion or Temple of Olympian Zeus must have been jaw-dropping its day and was the largest temple in the whole of Greece and apparently took 700 years to complete was, well, monumental. There were originally 104 massive columns 5 ½ feet in diameter, only 15 now remain. Hadrian dedicated the temple in 130 AD. The temple contained a gold and ivory figure of Zeus and Hadrian added a statue of himself beside it. We visited Delphi to see the ruins and walk up the Sacred Way. To think that we were actually walking where so many had walked to consult the Delphic Oracle. The situation of the Temple of Apollo beneath the slopes of Parnassus gave the place a strange feeling of tranquillity. In antiquity this was thought to be the centre of the universe. The view down the sacred plain to Itea with its groves of olive trees was breath-taking. Delphi is probably one of the most spectacular of all the ancient sites in Greece. We were appalled by the fact that they had not re-erected the fallen pillars of the Temple which lay and I believe still lie toppled like some child’s gigantic building bricks. People were standing on the fallen pillars and children were jumping on them. We thought that after a few more years of wear and they will lose all their fluting. We saw the famous bronze charioteer in the museum and met Antinous for the first time. We were to bump into him all over the world. The chryselephantine cult statues of wood with gold headdresses and other pieces of gold clothing assumed to be of Artemis and Apollo were very strange and quite unsettling. We sat in the theatre, one of the best preserved in Greece (4th century BC) and tried to imagine what it was like in its heyday. We also saw the beautiful circular Tholos (4th century) one of the finest buildings in Delphi. It’s dedication and purpose unknown. 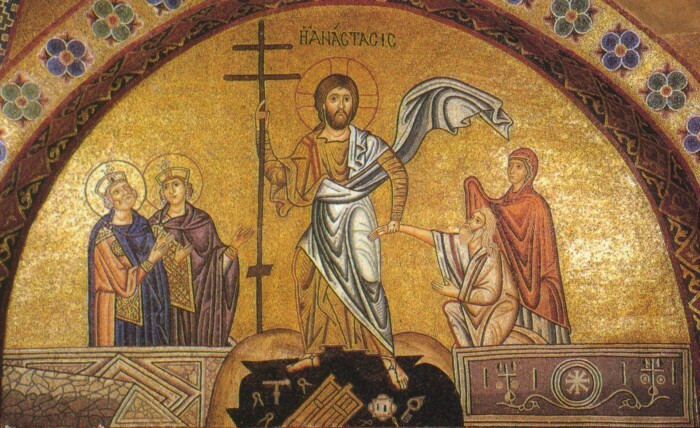 That afternoon on our return to Athens, we visited the monastery of Osios Loukas with its magnificent gold mosaics and promised ourselves that before we left Athens we would go to see the mosaics as Daphni. Two of the magnificent mosaics at the Monastery of Osios Loukas. We were the only two people visiting. On our way to Mycenae, we came to what was said to be the crossroads where Oedipus met, unbeknown to him, his father, who he killed as was prophesied and why as a baby he had been abandoned and then found and adopted and brought up in Tenea. At Mycenae we were first taken to the Treasury of Atreus sometimes called the Tomb of Agamemnon, neither of which are correct. ‘Agamemnon’s Tomb’ was beautifully constructed; thank goodness the whole edifice had not been carted off to the British Museum where huge portions of the decorative exterior now sit. We are totally against the return of the Elgin Marbles but the decorative pieces housed in the BM which always look somewhat forlorn, belong back here, it is a tragedy they are not returned. . It is one of the best preserved of the beehive tombs (1300 BC). Apparently nine of these have so far been discovered. I could not believe we were actually standing in one. After gazing at the BM’s looted pieces for so many years and trying to visualise their original setting and here it was and here we were. And then we started our ascent up the acropolis to the palace at Mycenae and there before us was the Lion Gate. We were actually standing in front of the Lion Gate, entrance to Mycenae. It was massive, We had no idea that the lions alone with their heads missing were 12 feet wide and 10 feet high. The grandeur of them was overpowering. Imagine Agamemnon clattering through the gate on his way back from Troy, with Cassandra probably calling out that they were going to their deaths, followed by wagon load after wagon load of treasure, his part of the spoils from Troy. We passed the grave circle where Schliemann found six shaft graves containing gold masks and a mass of gold objects, and declared he had looked on the face of Agamemnon. And then we were in the Palace of Mycenae. Very little remains but the setting is magnificent. So here we were where Agamemnon lived with his wife Clytemnestra, and here it was he left for Troy taking his daughter Iphigenia to be sacrificed to the gods so that the winds could blow and they could set sail. Here it was he returned from Troy with Cassandra in tow and was slaughtered in his bath by Aegisthus his wife’s lover while Clytemnestra slaughtered Cassandra. Here it was that Agamemnon’s son Orestes with the help of his sister Electra, murdered, his mother Clytemnestra and Aegisthus. Was any of it true, who cares, for us the place throbbed with the tale. We went on a coach trip to Cape Sounion to see the dazzling Temple of Poseidon, perched on the cliff edge. It was during a beautiful late afternoon, and we watched the sun slowly sinking into the sea. 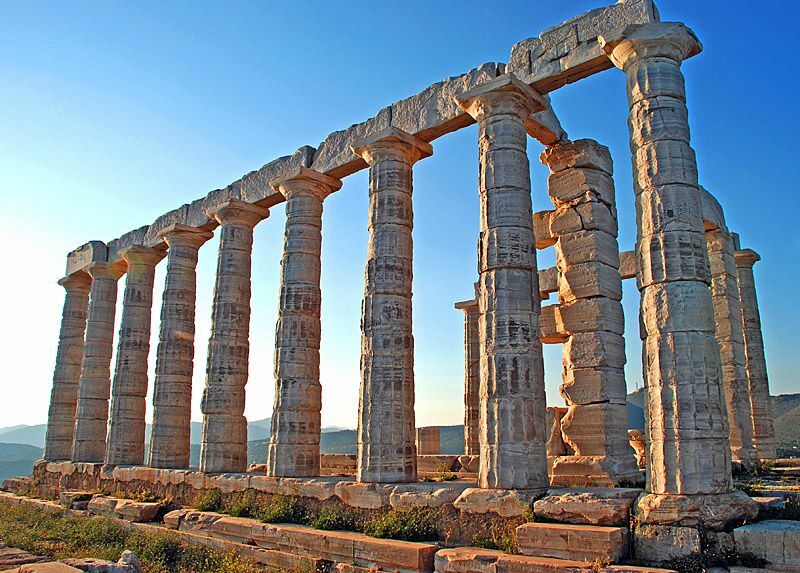 According to Greek mythology, Cape Sounion is where Aegeus, King of Athens, leapt to his death off the cliff, thus giving his name to the Aegean Sea. Aegeus had been waiting at Cape Sounion for the return of his son who had gone to kill the Minotaur, a monster, half man half bull and despaired when sighterd his son’s ship return with a black sail and believiving Theseus had been killed, committed suicide. The cape was carpeted with wild mauve crocuses and it had a magical atmosphere. A group of, sadly to say, English women, who would have been more comfortable on the beaches of Benidorm, were plucking up the crocuses by the handful. When we were returning to our coach we passed their coach and saw the sad spectacle of bunches of wilted crocuses strewn around the step to the coach. To this day I regret not getting on that coach and telling the bastards what I thought of them. Went to Epidauros, to see the great theatre (4century BC) the best preserved of all Greek theatres. Again the setting was truly magnificent. Our guide on this trip was a retired actress, lovely lady with enormous eyes and bursting with excitement, though goodness know how many times she had visited the theatre. She stood in the centre of the ‘stage’ circle and tore a piece of paper just to show us the theatre’s incredible acoustics. She then did her ‘Medea’ in Greek and brought the place down. Apollo was worshiped here and his son Aesclepius. The theatre is surrounded by the ruins of the Asclepieion, the healing centre of the Classical world. People, who were ill, flocked here in their thousands, hoping for a cure. Apparently they spent some nights here in the hope they would be visited in their dreams by Asclepius who would advise them on how to regain their health. There were a number of mineral springs in the area which were probably also used in the healing process. Of the temple of Asklepios nothing remains but the foundations. The doors of the temple were of ivory and the cult statue of Asklepios, according to Pausanias, was made of gold and ivory and the god was shown seated on a throne holding a staff in one hand and a serpent in the other. A dog was seated by his side. The Romans thrashed the place in 86 BC. On our final day we caught a local bus and went to see the magnificent 11th century mosaics in the Monastery of Daphni, and, we had the place to ourselves. I think these were the first great almost complete Byzantine mosaics we had seen and we found them overwhelming and very moving with the sun glinting on the golds and blues and reds. We were the only visitors. We then tried to get a bus back to Athens and found them all full with people returning from work. After the umpteenth bus had passed us full to the rafters, we finally managed to push our way onto one and only just got to the hotel in time to pack and go to dinner. Fleeing Athens. During the week we had slowly became aware of the chanting by the students in the Polytechnic opposite our hotel and the minor riots in Athens itself. Everything came to a head on our last evening in Athens. We were to leave in the late evening for our flight and went down to the hotel dining room for our evening meal before departure by coach to the airport. Half way through the meal there was a great deal of noise outside the hotel and we discovered that the students had begun their riot in earnest. All of a sudden the hotel found itself behind barriers which had been erected across the street, the students had even bent or broken the traffic lights and road signs opposite. Then the tanks began to roll by the hotel, followed by tear-gas and bullets. Into the hotel streamed students covered in blood trying to take shelter from the soldiers outside. The hotel guests were told by the staff, who were clearly on the side of the students, to go to our rooms and stay there. From there we watched the one-sided battle, with bullets flying across the street. At one point one student, covered in blood came into our room to look out of our window to see what was happening in the street. The barriers across the road proved not to be effective as the tanks went straight over them. The fighting continued and time was beginning to run out if we were to catch our flight out of Athens that night. As it was abundantly clear that the coach could not come and pick us up as there was a battle raging ouside, it was decided that we would leave the hotel by the back and go and look for the coach. Holding wet handkerchiefs to our faces to fend off the tear-gas, our small party left the hotel by a backstreet, carrying our luggage and escorted by some of the students. With streaming sore eyes we eventually found the coach, many streets away, and sped to the airport. We were quickly hustled through customs and walked across the tarmac carrying our entire luggage to the waiting BA plane. We understood later that our flight was one of, if not the last, flights out of Athens for four weeks. 1974. Exams At the beginning of 1974 I decided to take up an Open University Humanities Foundation course and received my full credit pass in September 1976, I then dropped it. I felt what was the point in spending hours and hours of study simply for what? To add a BA to my name? As I had never sat for a single GCE I decided that I would set myself the task of seeing if I could get O level English Language and English Literature, without any formal tutoring, I got the set books, studied them, looked at past examination questions, sat the examination and I passed. I just felt I had to test myself. At the same time I was directing a Midsummer’s Night’s Dream, the first time the GLC drama club had attempted a Shakespeare play. I felt pretty stretched at times. How or why I did it all, I do not know. We decided to tour the north coast of Scotland, visited ancient Brochs and truly magnificent scenery. The highlights was our visits to Cape Wrath the north west tip of Scotland, we always liked to get to such places and the most northern point on mainland Britain called Dunnet Head. So we set off for Cape Wrath and drove the car to the end of its road and were faced with a Loch the only way to get to the Cape we had read was by jeep. But how to get across loch to the jeep. Finally we found an old notice which said ‘Shout for boat’ now I haven’t got a loud shout, but guess who had. William gave a shout which would have put a sergeant-major to shame on a parade field and would have broken glass if he had made that sort of bellow in a room. For someone who is usually quiet and retiring, William never failed to amaze me. The next thing we know is that a small rowing boat sets off at the other end of the Loch complete with dog. We were rowed across, got into the jeep and were driven across to Cape Wrath. There was no track, instead we bumped and dived in and out of large craters, many filled with water. Apparently the land is used by the MOD to fire into, presumably from the sea, hence the craters. Presumably we were lucky to visit during a lull in gun fire. We passed magnificent beaches of golden sands, bumped out of our wits accompanied by a very excited dog, who like us was enjoying every minute. There was a lighthouse on the end of Cape Wrath. The rocks and the wild sea were all we could ask from such a significant spot. It was a beautiful day, blue sky, scudding clouds and the wind positively shrieking. What more can life offer. Dunnet Head was almost a let down after that but very beautiful in a very different way. Nearing the end we opened the gate to let the car through then drove as far to the edge as we possibly could; beautiful weather. We had taken a picnic with us and so there we sat at the British mainland’s most northerly point in a veritable garden of wild flowers, looking out to sea and had our picnic. We later found that the flowers included the Scottish primrose which is virtually unique to Dunnet Head. We did wonder why there were not more people, but clearly they had sadly been put off by the notice on the gate we only read on our way back – MOD – NO ENTRY. Sometime in 1974 a most extraordinary letter arrived in my office at the GLC, it was from Mrs Greville Howard, written from her home in Luxembourg offering her part of the magnificent Suffolk Collection of paintings to the Council. The collection consisted of 54 oil paintings, almost all portraits. The works of Kneller, Lely and their schools were represented, Hudson, Hogarth, Bol, an Annibale Carraci, works after Titian, Holbein and Van Dyck but most splendid of all was the collection of full length Jacobean portraits by William Larkin. Some of these portraits had featured in an exhibition at the Tate Gallery a few years earlier and had caused a sensation. Apparently the works had been offered to the National Portrait Gallery and the Tate Gallery who had both declined, and here they were being offered as a gift to the Greater London Council. The collection had formed part of the collection of the Earls of Suffolk which at one time had included the Virgin of the Rocks by Leonardo da Vinci which is now in the National Gallery. The collection had originally been housed in Charlton Park, near Malmesbury in Wiltshire, a Jacobean house built c.1607. The 19th Earl of Suffolk died in action during the 1st World War and the collection passed to his widow Margaret, Countess of Suffolk, who removed most of the collection to her house, Redlynch, Suffolk. On her death the Tintoretto was sold to the Fitzwilliam Museum, and the ‘Pelican’ portrait of Queen Elizabeth I to the Walker Art Gallery, Liverpool. There were other sales in 1973. The still magnificent remains were now being offered as a gift to the GLC. The Council owned Ranger’s House in Blackheath and had wondered for many years what on earth to do with it. It had belonged to the Earl of Chesterfield, he of the famous letters to his natural son. For a time the house was occupied by the Duchess of Brunswick whose daughter became the unfortunate wife of King George IV. The house then became the residence of the Ranger of Greenwich Park and after many years of being used as a residence by an Earl, a Princess and a General it was finally sold to the London County Council, who used part of the building as a tea room and waited for something to be housed in it. Over the years many ideas and collections were turned down. But at long last here was a collection, – the Suffolk Collection – which was worthy of the house. My boss Alan Hummerston, was given the task of going to Luxembourg to meet Mrs Howard and her husband and draw up a deed of gift. This he duly did sitting with them at a desk, in their home. He drew up a suitable document which seemed to satisfy them and, I think, returned with it duly signed. And suddenly Rangers House was filled with the Suffolk Collection. The Ranger’s House Gallery was duly opened by Queen Elizabeth the Queen Mother. Now at long last the stunning full-length’s many by William Larkin showing the Earls of Dorset and the Countesses of Dorset, Suffolk, Exeter, Oxford, Stamford and Elgin, not to mention a clutch of Royal portraits, graced its splendid rooms, the house and its collection were eventually gifted by the London Residuary Body to English Heritage on the abolition of the GLC. The collection, particularly the Larkins is now splendidly housed on the first floor of Kenwood House, do not miss them, they are one of the hidden glories of London. There is also an excellent book on the collection by Laura Houliston. Oh, and Kenwood also contains the magnificent Kenwood Collection, which came to the Council from the Earl of Iveagh and to which over the years the LCC and the GLC had added many fine pieces. No mention or credit is given, by English Heritage, to the care and devoted management of Kenwood and the other houses owned by the LCC and the GLC over the period of their guardianship. Hardly a year went by without some acquisition being made by these councils to its historic houses not to mention the important exhibitions that were held in Kenwood for many years. Death of Brian June,1974. In June 1974, my uncle Brian died at the age of 43, and his meagre estate was divided between my mother and her sister Joan. His was a sad, sad life, blighted first by the death of his mother and then everyone failing to bring him up properly so that he went native among the riff-raff of Scholes Street. He suffered from the bullying by his cousins which left a great scar of hatred and bitterness in his heart. His cousins both succeeded in life and became very wealthy. He meanwhile slid into nothing short of a yob, one of the most handsome yobs to be seen in Salford. Most of his Salford pals tried to better themselves; his closest friend actually joined the police and made a success of it. Brian had nothing but scorn for him and ceased being his friend. Most of his pals married and settled down with their children and their mortgages. Not Brian who defiantly remained unmarried. Though he must have had many girlfriends, none were ever invited to the house. His opinion of women generally was of contempt, what that was all about, is a mystery, he certainly wasn’t gay. And then he had the accident, which removed most of his face which was stitched back in a grotesque mask. He put on weight and just let himself go physically. He always had a soft spot for my mother and treated her with great kindness in his bluff and hearty manner. Sadly, during the time I knew them, he treated his father with utter contempt and often shouted and scorned him. I think he blamed him for all that had gone wrong with his life. He was always friendly towards me; but hadn’t a clue what I was about. What a sad, blighted life. 1974 October – Death of William’s mother. Sadly on 12 October 1974 William’s mother died in hospital in Cape Town. She was only 63. William flew to Cape Town for her funeral. His parents had agreed that he would inherit half her estate, which, of course, had been her inheritance from her father and mother. For the first time William had to learn to cope with a portfolio of stocks and shares. Sadly he fell into the hands of a stockbroker who spent most of his time selling and buying, something he eventually put a stop to. Sometime after his return to England, William’s father wrote to him to say he had decided to come to settle in England and to live with William. William was told to buy a larger flat for them both. 1975 Watford. William bought a two bedroomed flat in Watford, 21 The Spinney for the handsome sum of £14,750. It was a ground floor flat of a three floor block one of several blocks set in some pretty gardens with trees and lawns. A few minutes’ walk from Watford station. His father packed up all his belongings in South Africa and sent them to William to furnish the new flat. However by the time William had moved into the flat, and we had unpacked everything from South Africa and settled in, his father wrote to say that he would not be returning to England but was going to marry Joan, one of his father and mother’s closest friends who was a widow and had a flat of her own in Cape Town. Crantock Bay. In May that year we all went to Crantock Bay, Cornwall, for a week. Glorious weather as usual. We did an almost daily walk to Porth Joke, a small secluded golden beach nearby. Polly Joke or Porth Joke. Usually totally deserted in those days. Porth Joke. The side of the boggy footpath covered in wild irises. From there we climbed up and onto the cliffs for a few miles to Holywell Bay. and to Trerice House (NT) for lunch. Back to the hotel for a delightful dinner, and the proprietor, sometime during the week gave a slide show of his year in Cornwall and the places they had visited for holiday. No TV, thank heaven. Everyone in the hotel sat around in the lounge playing card games or scrabble, or just talked or read a book. With the advent of TV in every room which happened at the hotel, no one could be seen in the lounge and the whole atmosphere changed. The Foxes. Each evening after dinner, William and I would go for a walk along the deserted cliffs near the hotel, and one year we noticed that in a old fence wall now covered in wild flowers, a pair of foxes were raising two young cubs and they would all be standing in and around their burrow, and of course fled the moment they saw us. The wind singing in our ears and the sun setting and the foxes scuttling into their den, such tranquillity and utter beauty. One day in the afternoon my mother, William and I were walking along this same public footpath on our way to Port Joke a nearby secluded beach, when suddenly we were surrounded by dogs, then horses and crowds and found our selves literally in the middle of a hunt. We were at this time near the burrow of the foxes and it slowly dawned on us that they were about to be torn apart in front of our eyes. As indeed they were, all four of them. This on National Trust land, just off a public footpath and before the hunting ban. We were sickened not only by the sight, but also by the foul looks of delight from the huntsmen and the cheering crowd as these poor wretches were torn limb of limb. My mother was absolutely frightened by the large horses which surrounded us and the delighted crowds and nearly fell to the ground, and but for the two of us by her side would have done so. I shouted at one of the nearby riders that I was sickened and disgusted that he could get such enjoyment from such cruelty and was told to ‘F… O.. back to London’ and then we were jeered at by the hunt followers. I do not think anyone had ever sworn at my mother, who was by now almost fainting. We sat on the bank of the footpath, helpless, amid the horses and that vile crowd, while they got on with enjoying the butchery. We were all shaken and instantly became supporters for people who sought to ban this outrageous and disgusting ‘sport’. When they all left, and it was finally safe to get to our feet, all the flowers on the wall over the burrow were gone and there was blood and fur everywhere. None of us ever walked on that path again, and we left very shaken and curtailed our holiday and returned home. I think we did not visit Crantock Bay for about two years after that. Ted and Joan. In June William’s father Ted and his wife Joan, now William’s stepmother, came to visit us in England. William had known Joan for a great number of years. She was a kindly lady but could be very unthinking and was, what I think the Georgians would have called, ‘a sad rattle’. She was quite empty headed but could not stop talking absolute nonsense, bringing any intelligent conversation to a full stop with some perfectly nonsensical comment and as no one was prepared to say that it was nothing to do with what we were talking about, had to politely change the subject. Why were we so nice to the wretched woman? The first day William went to work leaving them in the flat, Joan without asking, decided to change all the furniture around. We had arranged everything to our liking, and now Joan rearranged everything to her liking. How she moved heavy chests of drawers, bookcases. etc., I do not know, but move them she did. William was a little startled on his return, but ever the gentleman, said nothing, but I have to confess that I was blazing mad and could barely contain my tongue. She then proceeded to give away family pieces to all and sundry and presented my mother with a complete tea service. My mother returned it when they left. Also when they left we moved all the furniture back to its original place. However before they returned to South Africa we did a short trip to Wales visiting Lake Vyrny. As a final present to us Joan went through the kitchen and wrapped everything up in plastic bags, including all the cutlery. She was clearly under the impression that neither of us ever went into the kitchen and everything would remain as she left it until her next visit in a couple of year’s time. We never did understand what that was all about and spent a great deal of time unwrapping everything and in doing so discovered that some nice pieces of family porcelain which had once belonged to William’s grandparents had been given by Joan to the cleaning lady. Fortunately she overlooked disposing of two very handsome Lalique bowls which had been wedding presents to William’s parents. She also disposed of, goodness knows to who, a wooden carved Chinese tree set in a highly carved crystal base the beautifully carved leaves of the tree made of pale green jade. It once took pride of place in William’s grandparents house and I had placed it on a small table in the centre of William’s living room. I was blazing mad, but William, ever the gentleman, did not want to hurt Joan by making a scene, so that was that. One other prized possession which even William was upset about but again was not prepared to upset Joan, was a lock of Captain Cook’s hair set in a beautiful silver locket, which had been handed down through the family and had once, according to family legend, belonged to Cook’s widow who had given it to one of William’s ancestors. We researched where his widow had lived and found that indeed it was very close to a farm owned by one of William’s ancestors. I presume that Joan looking through all William’s drawers found it and thought it can be of no use to a man and that also disappeared, given to some passing relative or friend – Joan and Ted did a round of visits to all his friends and relatives. I sometimes wish William wasn’t such a gentle man. She really was the most impossible thoughtless busybody.